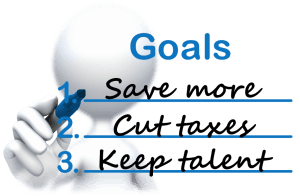 Meeting your defined contribution plan goals? If you have defined contribution plan you may not be aware of all of your plan maximum savings options. How you achieve these numbers isn’t straight forward. You may be able to skew employer contributions to benefit you and the highly compensated employees. An actuary, attorney or companies that specialize in what is known as plan design can run the numbers. By the way ,If you are over age 50 you get to add another $5000 to all of the above except the cash balance plan. These numbers are subject to indexing. Knowing how much you need to save is the key. I recommend not using rules of thumb or guessing. Your future retirement lifestyle is too important to compromise on. The only way t find out if your plan is meeting your savings need is to have a CERTIFED FINANCIAL PLANNER™ professional or other retirement planning expert help. You can also choose to pay your plan’s investment advisor or broker fees/commission directly as well. Paying for investment advice in the current tax year not only reduces your taxes but also increases the return on your investments. The General Accounting office has shown that a half percent reduction in fees can provide you with about a 17% increase in your accumulated balance in about 20 years.1 Are you doing all you can to reduce your tax burden? If your goal is to help your employees retire then several studies show that they need to work with an advisor. That they would be better off working with an advisor to help them with their asset allocation decisions and their savings decisions. Vanguard’s research recently said the greatest benefit of working with an advisor is actually in helping people’s behaviors such as continuing to save and not jumping out jumping in and out of investments at the wrong time. Even if your goal is not to be so paternalistic/maternalistic with your employees there are also other benefits accruing to you by helping your employees retire. There is a 24% higher healthcare costs in people who are stressed about finances.2 Healthcare costs typically rise for an aging work force. This doesn’t even take into consideration the costs of lost productivity. Are your highly compensated employees on track to retire? Are older employees jacking up your health costs on track too? If not, contact us to discuss the merits of one-on-one advice and other solutions to help get you on track to meeting your defined contribution goals. (1) PRIVATE PENSIONS, 401(k) Plan Participants and Sponsors Need Better Information on Fees, 2007. More recent data may alter these assessments or outcomes. (2) Higher Health Care Costs for Metabolic Syndrome Risk, Disabled World, September 2009. More recent data may alter these assessments or outcomes. (3) The opinions voiced in this material are for general information only and are not intended to provide specific advice or recommendations for any individual. (4) Securities and Advisory services offered through LPL Financial, a Registered Investment Advisor. Member FINRA/SIPC. (5) The LPL Financial Registered Representatives associated with this site may only discuss and/or transact securities business with residents of the following states: AZ, IL, MI.